John Obi Mikel signs a 5 year contract. Ok I might be pedantic but seriously have they stopped teaching people the difference between their, there & they're?? Typical Torres starts scoring again just in time for playing us. Great to see both chelsea and city out. Inexcusable given their wealth and players. Chelsea will get back to winning ways in the league this weekend and will be in the mix for the title at the end of the season. Id have to agree with this. How do ya think they ll treat the europa league? I don't quite see how you cherish the memory of the dead by killing another million. And, this is not combat, it's an act of lunacy, General Sir. Personally, I think you're a f**king idiot. I think they will take it seriously. If they were to win it, they'd be the first team to win the two European trophies in a row, the opposite way around. Benitez would also have some credibility with the board if they were to win it. Getting knocked out of the Champions League was because of RDM's mistakes. They still have a very good squad and only a month ago they were four points clear of United before that infamous game. They've had a bad month or so but to be writing them off is crazy. RDM should never have been sacked, Abromovich is a bit of a clown as well but they've three of the best creative players in England (Oscar, Mata, Hazard) and they'll have a new striker coming in January also. I thought it was a bizarre appointment at the time given Rafas history with the Chelsea fans and the fact that he agreed to such a short term contract. load of rangers fans in with the chelsea fans causing trouble at S0L yesterday they are total scum bags. As if there wasn't already enough reasons to loath Chelsea. was coming out of stamford bridge and heard one scottish "chelsea" fan saying to another " have you heard the celtic result ?" "i know , disaster"
How do you know they were Rangers fans? I know a few Chelsea fans who were there and they were kicking off at the stewards in the SoL, who were throwing people out for persistent standing and singing, ...., at a football match . I have witnessed the same behavior in person. Boro were equally as bad when they were in the PL. Must be something in the water in the North East. Gers fans used to meet up withi chelsea fans at Roker Park back in the day and cause bother so its nothing new. I wonder how seriously Chelsea are taking tonights cup tie with Leeds ? 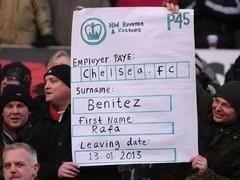 I wonder if the Chelsea fans will start singing Rafa Benitezs name now after todays result. Delighted to see Torres scoring, Rafa really does bring the best out of him. The way Chelsea are playing I can see them finishing in the top two at least. Everton should've been 2 or 3 up by the time they even got into the game. heard a n/castle fan saying on a phone in that the worst thing about the Ba deal was selling him to a local rival ! 5 wins in 6 in the league for Rafa since Chelsea's return from Japan. Not too bad. Ended Stoke's 11 month unbeaten league run at home. Credit where credit is due Ken. Great win for Chelsea, dont remember ur beloved Mancs ever having it so easy at the Brittania. Benitez shouting his mouth off ahead of tonights league cup game not sure if thats a wise move. A threee match ban would have been about right for Hazard an FA charge is OTT. Chelsea are my tip for the FA cup now judging by the luck they enjoyed yesterday ! Chelseaa are my tip for the FA cup now judging by the luck they enjoyed yesterday ! well they are hardly going to be outsiders, Vaux. not exactly a tip. Is there any need then again you are a Leeds fan so no surprise there. That said fair place to you yesterday beating Spurs but it will be tough for you against Man city. Reports on twitter that William Hill have stopped taking odds on Rafa to be the next manager sacked in the EPL. Odds slashed from 10/1 to 7/4. Chelsea have blown a 2 0 lead at Reading and yer man super sub has done it again with two goals. Rafa won't be the gaffer for much longer. Got a feeling Chelsea will lose at the wonga dome tomorrow. Chelsea fans should stop complaining. They're a midtable club. Feel sorry for Rafa (Benitez), half the players he's got have no heart or desire. Mourinho on his way back to Chelsea ? Looks like Chelsea have finally got a manager who is not bullied by Terry given that Rafa won't play the horrible kernt. Just a shame Rafa is a sh*t gaffer. Game set and match to Chelsea now 2 0.
Who have they got in the fifth round ? Krusty the clown is 1 dirty f**ker. Hopefully Man U will put chelsea to the sword in the next round. No Lampard tonight Chelsea might regret that.